Appetizer: Panini I had the Italiano panini and all I can scream is…..cheesy goodness! Soft mozzarella cheese like no other. Then there was this slight herby tang to each bite that made me do that leg-shake thing you do when eating something really good. I loved it! Melanin Tee had the Chicken Panini. The pink sauce on the plate was a case of love at first sight for me. Peep how fresh that bread looks. 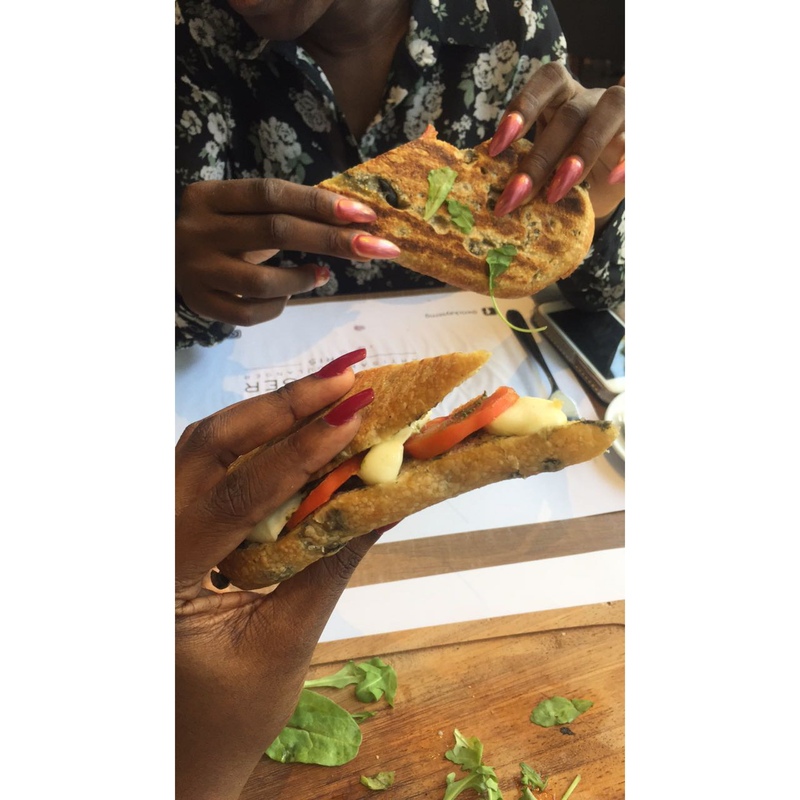 The moment our sandwiches arrived, we knew we were going to run into trouble with the generous portion size so we got the waiter to cancel the rest of Melanin Tee’s order, we had to share or risk our tummies burst. This plate right here was simply a transport to Italy! The sauciness, the sharp flavors, the al dente pasta….just delicious. Words can’t even describe. Normally, I would fuss over not having meat but this was well worth the sacrifice. Melanin Tee was another happy kid on the pasta table! Dessert: Éclair My high expectations were definitely met here. First off, look at those details! The preciseness of the marble icing and the Eric Kayser signature spoke to me in all manners of sophistication. Then the deliciousness…..crisp on the outside, creamy on the inside, sweet and light…..I would have this every day but the fear of an overly fat stomach is the beginning of wisdom. Drinks I had a cheesecake milkshake and it was so good, it made it to my Sideview Magazine list of sensational milkshakes in Lagos! Additional pleasure: Madeleines & Ice cream The most exciting part…..they have a huge display section for baked lovelies and decadent ice cream! Discussing this section would have to come in it’s own blog post because there’s quite a lot to explore so watch out for that. Location: 864A, Bishop Abayode Cole Street, Victoria Island.